Happy National Nutrition Month! Every mom wants to make healthy food choices for themselves and their children. But are you also making safe food choices? 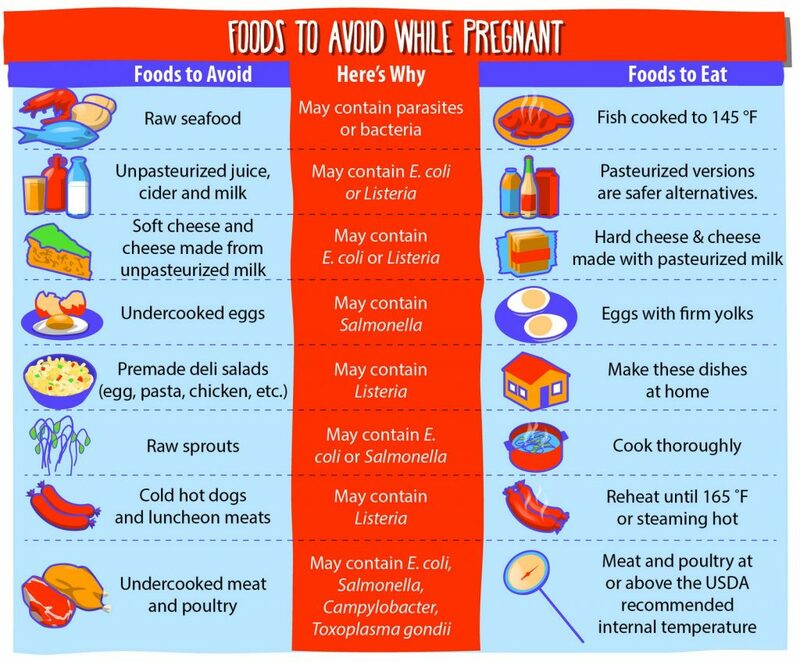 Choose these foods to help keep you and your baby safe during pregnancy. You may love sushi, but don’t eat it when you are pregnant. Raw fish and seafood can have harmful germs that can cause you to be sick. The good news is that cooking kills those germs. Choose seafood that’s fully cooked to 145°F. Check the temperature with a food thermometer. When seafood is fully cooked, it should be white, opaque, flaky and cut easily with a fork. Have you heard of raw milk? Raw milk isn’t safe during pregnancy because it’s not pasteurized. If a food is pasteurized, it’s heated to kill harmful germs. Unpasteurized foods are not safe for pregnant women. Make sure your milk, juice, cider and cheese are pasteurized. You can find them in the refrigerated section of your grocery store. Check product labels to make sure the food is pasteurized. Pick cheese made with pasteurized milk or hard cheeses like cheddar, instead of soft ones, like feta or brie. Sunnyside up, soft boiled, or poached? Just say NO to undercooked eggs during your pregnancy! Eggs should be cooked until the yolks are firm. Cook quiches or egg casseroles to 165°F. Many people eat raw sprouts, like alfalfa or mung bean, to be healthy. But this isn’t safe during pregnancy. Cook your sprouts thoroughly – boiling works well. Before you eat other raw fruits and veggies, rinse them well. 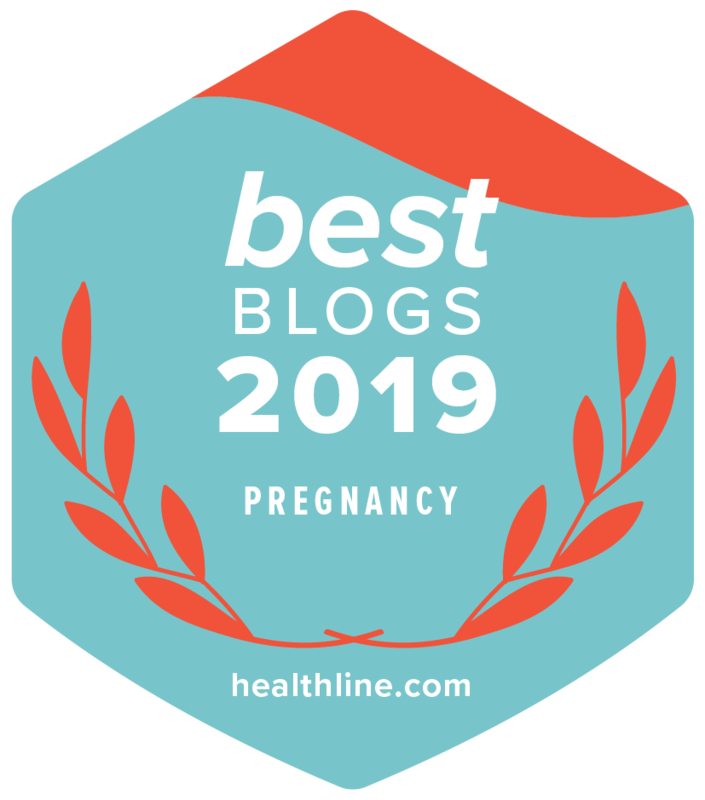 Are you craving meat during your pregnancy? Make sure it’s fully cooked! Don’t use color, touch or time to tell if your food is done. The only safe way to know if meat and poultry are fully cooked is to make sure they reach a safe internal temperature. Cook whole cuts of meat to 145°F, ground meat to 160°F and chicken and poultry to 165°F. Check the temperature with a food thermometer. With these safer food choices, you can have a healthy and happy National Nutrition Month! Do you have food safety questions? 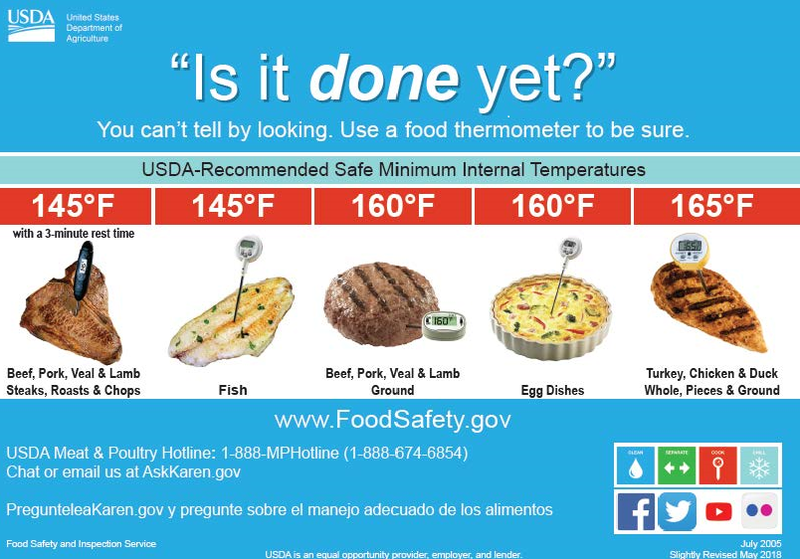 Call the USDA Meat and Poultry Hotline at 1-888-MPHotline (1-888-674-6854) or email or chat via Ask Karen (English/Inglés) or Pregúntele a Karen (Spanish/Español). Chrystal Okonta works with Food Safety Education at the U. S. Department of Agriculture’s Food Safety and Inspection Service. She is a graduate student at Johns Hopkins University Bloomberg School of Public Health, pursuing a Master’s degree in Health Education and Health Communication.